Our flight from London Heathrow departed in good time and it was a smooth, uneventful flight to Athens. We had prearranged a transfer with Celebrity at the time of our booking as we were arriving on the day of embarkation. This was our first time using the Celebrity Transfer service and we were not sure what to expect. After collecting our luggage, we entered the Arrivals hall and to our delight could easily identify and locate the Celebrity Transfer personnel. They signed us in and after a short wait for a few other passengers, we were escorted to a private van and taken to the Port of Piraeus. The transfer service was easy, efficient, and we would definitely hire them again, if arriving on the day of embarkation. 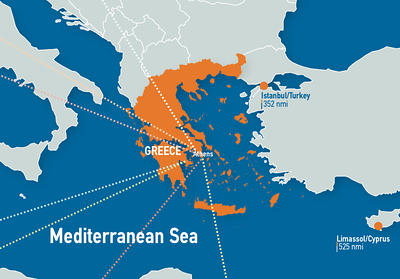 The Port of Piraeus is the largest seaport in Greece and one of the largest ports in Europe. 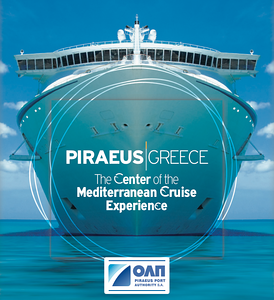 It has 11 places for the simultaneous berthing of vessels and can accommodate even the largest cruise ships. Cruise ships dock at the new passenger terminal, which is one mile from the centre of Piraeus and eight miles from Athens. There are two terminals, “A” and “B” that are less than half a kilometre (0.31 miles) apart. We entered our specified Terminal (from our Celebrity e-docs) and the check in procedure was very efficient and we were boarding the Constellation in a very short time (much more efficient than our Venice embarkation!). As we had arrived after 2 pm, sadly we could not indulge in the embarkation lunch at Luminae. However, we proceeded to Michael’s Lounge and enjoyed a few light snacks and a glass of wine, until our room was ready. 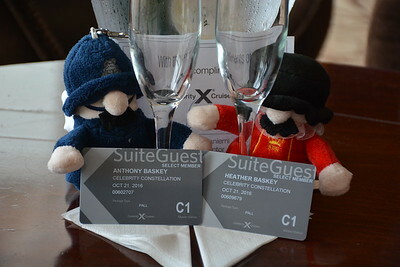 It wasn’t long before we were informed our Suite was ready and we proceeded to Deck 6, mid-ship, and entered Celebrity Suite 6106. This was our first cabin after the Penthouse (May 2016), so we knew it was going to be 1/4 of the size 😉 We entered the suite and we were quite impressed with the style and layout of the cabin. Big beautiful bowed windows brightened the entire room, a small – yet lovely dining room area, a wide open spaced living room, a separate bedroom with a good sized walk-in closet with vanity, and finally a nice sized bathroom off the main bedroom. There is a large console in the bedroom that houses a second television which is quite nice, but does limit manoeuvrability within the room. Other cruisers have commented on this that the console is really not necessary, simply mount the TV on the wall and this would increase the space to move around the bedroom. In addition, one other improvement would be the bathroom. The jacuzzi tub did not work (after I reported it twice to staff) and the step-over into the tub is quite high. We were fine, but those with mobility issues would find it quite cumbersome to step into to have a bath or a shower. Finally, the shower head is positioned quite low, so if you are tall (I am 5’6 and could just crouch beneath the shower head); washing your hair proves challenging at best. Other than those few kinks, the Celebrity Suite on the M-Class ships is lovely and we would not hesitate in the least to book it again. It was a short time before we met our first Butler. He introduced himself and explained that he was also taking care of Suites on the other decks as well. We were not certain what this meant in terms of service, but we would find out later! As always, embarkation day for us is a day of relaxation and we quietly explored (or shall I say re-explored) the Connie and had a lovely afternoon just enjoyed this magnificent ship. Muster Drill was scheduled for 9:45 pm, which was quite late and several people complained how it disrupted their dining and/or entertainment plans. For us? Carpe Diem! we were just happy to be on board. For our first dinner, we decided to dine in BLU. Although BLU is the venue for Aqua Class guests, Suite guests are permitted to dine there on a space available basis. We had a very warm welcome from fellow Canadian, Maitre’D David, who remembered us from our May 2016 sailing. Following an excellent meal in BLU we enjoyed a relaxing walk around the outer decks after dinner. Muster Drill at 9:45 pm was fast, efficient, and shortly thereafter, we sailed away from Athens at 10:30 pm.